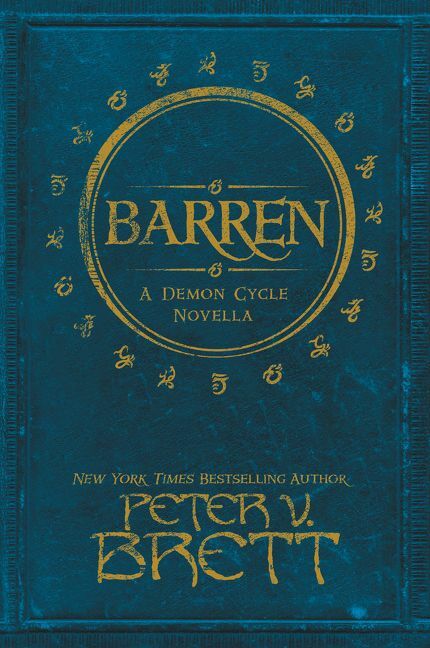 The stories of the Demon Cycle series continue with the novella Barren. The book focuses on Tibbet’s Brook and speaker Selia Square. It’s a different look at the factions and politics of the Brook, as well as a much deeper look at Selia, the Town Speaker. The story covers the events leading up to the big battle as the mind demon’s rise to the surface and bring war to the humans. It also touches on some areas of the past as it explores Selia’s young adulthood before she ever became Town Speaker. For fans of the series, this is a good story to check out. It’s a softcover that’s a 135 pages in length (there’s also a hardcover and audiobook version), about two evenings depending on how you spread it out. All of the focus is on Selia, and she turns out to be an interesting character. The novella deals with her romantic relationship with Lesa, the ghosts of her past, and her struggle to lead the Brook through the battle to come despite misgivings with its other leaders. Arlen and Renna don’t show up in the story, though the characters reference them every now and then. However, Arlen’s father Jeph plays a part. But those elements never overshadow the focus. Peter V. Brett stays on track and keeps this adventure solely on Selia, whether it’s in the present or the past. Without spoiling anything, anyone who is a fan of the series will want to check this one out. It’s a good read. And if you’ve never read the series, this might be a good way to try it out and see if you like it. Since the book focuses on Selia, it’s fairly self-contained. There’s no need to know everything else that’s gone on as whatever you need to know is in there. Anything else that might be mysterious would help spark that desire to read on and check out the other books. Either way, I give this one a four out of five metal bikinis. It’s a good read and a quick one, helping to explore a bit more of the world and its characters.